Mohit and Eshita Bhaskar are both employed and live in a rented house in Lucknow. They bring in a combined monthly income of Rs 80,000. 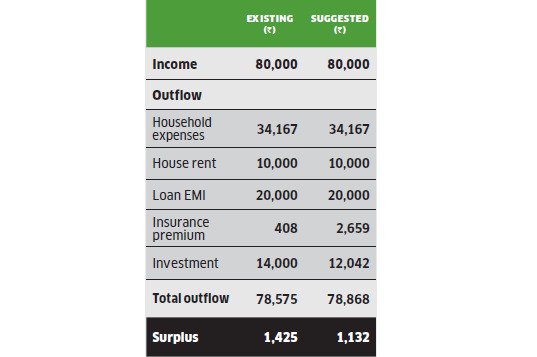 After considering household expenses, rent, insurance premium and investments, they are left with a surplus of Rs 1,425. Their portfolio includes equity worth Rs 3.8 lakh in mutual funds, debt worth Rs 2.9 lakh as PPF and fixed deposit, and cash of Rs 15,000. Their goals include building an emergency fund, saving for the wedding of Mohit’s sister, buying a car and a house, saving for their future child’s education and wedding, and their retirement. According to Fincart, the couple will have to put off some of these goals for now due to lack of surpus. However, an early start means the couple will have plenty of time to save for these goals after a rise in both their salaries. They can start by building an emergency fund of Rs 1.9 lakh, which is equal to three months’ expenses, by allocating their cash and fixed deposit amount of Rs 1.25 lakh. This should be invested in a liquid or short-duration debt fund. For the balance, they should invest Rs 5,000 in the same fund for a year. To save Rs 2.2 lakh for the sister’s wedding in two years, the couple will have to assign their mutual fund corpus, which will be enough to amass the required funds in the specified time. No existing resource or further investment will be required for this goal. Investment for both these goals will have to start after a rise in income and completion of emergency goal. Annual return assumed to be 12% for equity and 8% for hybrid funds. Inflation assumed to be 6%. In order to accumulate Rs 1.3 crore for their future child’s education in 20 years, the couple will need to start an SIP of 7,000 in an equity fund. As for the Rs 1.2 crore they need for the kid’s wedding in 25 years, the couple will have to start an SIP of Rs 7,564 in an equity fund. For retirement in 30 years, they will need Rs 6.9 crore and will have to start an SIP of Rs 18,540. However, they will have to put off both these goals till a further rise in income. They will also have to hold the goals of buying a car and house till they have sufficient surplus to invest for these. 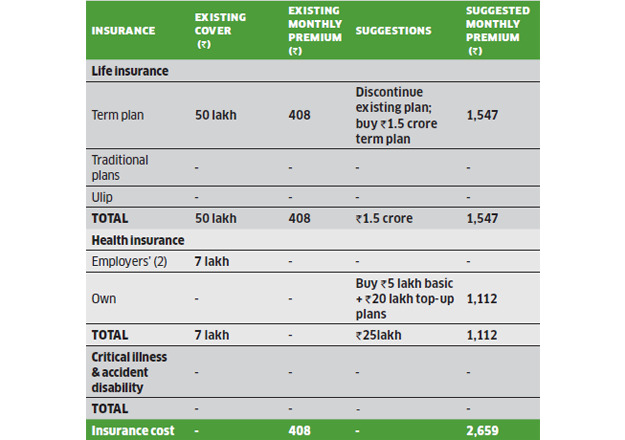 For life insurance, Mohit has a term plan of Rs 50 lakh, but Fincart suggests he discontinue this and buy a Rs 1.5 crore term plan at a premium of Rs 1,547 a month. For health insurance, both Mohit and Eshita are covered by their employers for a total of Rs 7 lakh, but Fincart suggests they buy an independent plan of Rs 5 lakh and a Rs 20 lakh top-up plan. Both these will come for a monthly premium of Rs 1,112.